Mary "Mollie" Taylor, born to John & Eliza (Cagle) Taylor in May 1836, was the fourth child in the family and the second daughter. Her name first appears on the 1850 Federal Census as Mary Taylor, age 14. By 1860, Mary had married Thomas Pinkney Curtis, son of Solomon and Charlotte (Heaton) Curtis. The couple had three children: Charles Franklin, Mary Jane and Malissa. Mollie's sister, Eliza Jane Taylor, also married a Curtis brother--Benjamin Franklin Curtis. So the connection between the Taylor and Curtis families extended to two marriages....two Taylor sisters married two Curtis brothers. On March 1, 1858, Thomas P. Curtis applied for a United States Land Grant in Hancock County (later known as Winston) for 120 acres. The land was located in Township 11S, Range 8W, Section 20. Dear Sir; I have received information, that a Capt. Whatley (who, I believe, is under your command) with a portion of his command, sometime about the 20th of January, went to Houston, the county-site of Winston Co. Ala, and arrested the Judge of Probate of that County, T.P. Curtis and carried him off, in the direction of Jasper, Walker Co. and murdered him. His body has been since found, shewing evidence of gun shot wounds. The body was found in an out-of-way place, concealed from view. It is further said that, after having arrested Judge Curtis, they forced his wife to give up the keys of the Jail, in which the salt sent there, by the State to be distributed among indigent families, was stored, that this salt was taken - and sold - and the proceeds, appropriated to the use of the men in Capt. Whatley's command. If these things are true, no punishment is too great for such men. Such conduct will do more injury to our cause, than a Yankee Raid. I write you this, believing that you will have the matter properly investigated, and, if the facts justify it, have the proper punishment inflicted for such conduct. (signed) Thos H. Watts Gov of Ala.
Captain Whatley mentioned in the above letter was attributed to belong to Confederates in Roddy's Command. Mollie's husband "Tom Pink" was not the only Curtis brother to be killed by the hands of the Confederates. George Washington "Wash" Curtis was the first murdered in 1862. Slightly more than a year later, his brother Joel Jackson Curtis was killed in December of 1863. After the death of her first husband, Mollie married James D. "J. D." Smith on June 27, 1865. Their marriage was performed by Mollie's brother, Francis Marion Taylor who was Justice of the Peace. A document in the Union pension file for J.D. reveals the date and place of the wedding. Their marriage took place at the home of the bride's father, John Taylor. The Smith family had other connections to the Taylors. J.D. 's sister, Elizabeth Smith, married Francis Marion Taylor. James Smith was a sergeant in the 1st Alabama Calvary, Union. He filed a pension for an indigent claim before his death. Mollie also made a claim after his death in 1909. Mollie and J. D. had two children: Sarah and Roxanna. The family continued to live in Beat 2, Winston County through June of 1880. J.D. was the father of 8 children by his step-daughter, Mary Jane Curtis (daughter of Mary Mollie and Tom Pink Curtis). These children assumed the surname of Curtis for the most part. By the next federal census in 1900, the family had moved to Thaxton, Pontotoc County, Mississippi. Nine years later, J. D. died. He is buried in Bethel Cemetery, Union County, Mississippi. A tombstone was erected. 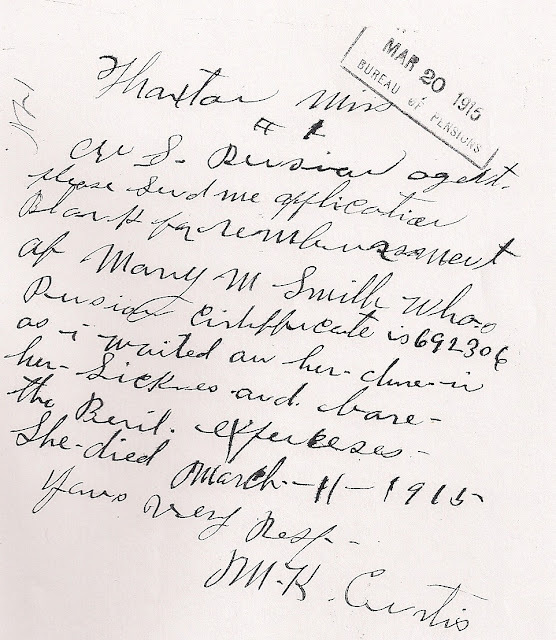 Mollie died at the age of 78 on March 11, 1915 at the home of her grandson, Mark K. Smith. According to pension documents filed by Mark for reimbursement of funeral expenses, her cause of death was "bronchitis and old age." Mollie is buried in Bethel Cemetery, according to the documents. However, a tombstone for Mollie has not been found. There is a blank area located between the tombstones of J.D. and his son, F. M. Curtis, that is believed to be the burial place for Mollie. Charles Franklin Curtis married Elizabeth Henson. He married Mary Alred in 1911. In 1920, Charles Franklin and Mary were living in Lawrence County, Tennessee. Charles Franklin, who died in 1926, is buried in St. Truitt Cemetery in Liberty Grove, Lawrence, Tennessee. Mary Jane Curtis was the mother of 8 children: Frances Martha "Fannie", Charles, Thomas Jefferson "Jeff", Franklin, Walter Thomas, Jessie Daniel, F. Marion and Mark K. Curtis. A memorial has been erected in her honor in Curtis Cemetery, Winston County. Alabama death records show she died in July 15, 1890 and is buried in Sardis Church Cemetery. Malissa married (1) Samuel Estes and (2) Edd Logan.